Lyam White, Terry Crane, and David Godsey in Fail Better: Beckett Moves UMO. Photo by Jeff Dunnicliff. BOTTOM LINE: An original production inspired by the work of Samuel Beckett using the language of physical theatre and movement as the lens through which to explore the human condition. Believe it or not, the title of the FringeNYC production Fail Better: Beckett Moves UMO says it all, and yet if you are unfamiliar with the work of Samuel Beckett and equally unfamiliar with the work of the Pacific Northwest-based UMO Ensemble, well, maybe the title only makes things more inscrutable. Fear not. All you really need to know about Fail Better, is that it is a lively and original production inspired by the work of Samuel Beckett who is perhaps one of the most innovative twentieth century playwrights known for works that are minimalist, absurd, poetic, and that often combine tragedy and dark comedy in exploring what it means to be human. 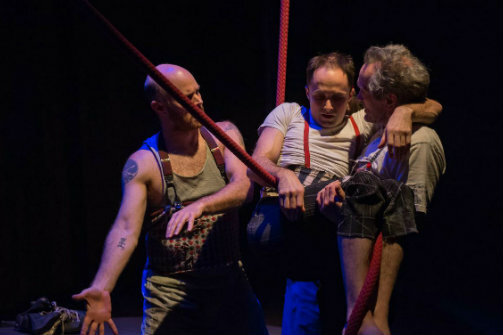 The UMO Ensemble, whose self-described mission is to “stir the human spirit and incite the imagination,” is well equipped to tackle everything Beckett-like which is precisely what they do in this production using all the tools in their repertoire of physical theatre which includes (but is not limited to) clowning, aerial rope work, soundscapes, and sometimes even silence. If you are the type of viewer that needs some more concrete information in order to fully appreciate what you are seeing, read on. The show’s title was inspired by a quote of Beckett’s: “Ever tried. Ever failed. No Matter. Try Again. Fail again. Fail Better.” The production was inspired by one of his lesser-known texts, The Unnamable. These two pieces of raw material are the foundation from which UMO builds an original narrative where six Beckettian characters act out different moments and themes reminiscent of Beckett’s work. They certainly have a script to call upon but most notably perform using the language of physical theatre and interaction with a set which includes a giant teeter totter to simulate the idea of tenuousness and balance, scaffolding upon which the performers climb and from which they leap, and ropes and pulleys in which they entwine and suspend themselves in feats of aerial wonder. Indeed, poignant and impactful moments occur where questions of what it means to be human are inspired by Beckett but come to life through the staging, the set pieces, the collaborative acrobatics, and the aerial rope work by Janet McAlpin and Terry Crane. Beyond that, I cannot really tell you what will occur for you as you watch Fail Better for sometimes it seems more like a living sculpture than a play. Much of the dialogue is stream-of-consciousness intending to summon and dance with an idea rather than to articulate it categorically. Loss, love, desire, humor, tragedy, regret, confusion, and ridiculousness are all present for you to experience as long as you don’t expect anything to be too logical, for Fail Better is not exactly a story with a beginning, a middle, and an end. It is, rather, a collage of some parts of the human experience. Luckily, the only framework you need to enjoy this experience is to come in with an open, curious mind, and let the bizarre, random beauty wash over you.